Compared to an Engel chest fridge of the same size, you’re saving yourself exactly $700. The 80-litre Engel ST90F I have goes for $1,325 RRP. That’s about 14 cartons of Coopers Pale Ale. Three hundred and thirty-six stubbies. It’s cheaper because it’s not made of heavy-duty materials. This makes it much lighter – a benefit that many overweight 4WDs should really care about more. 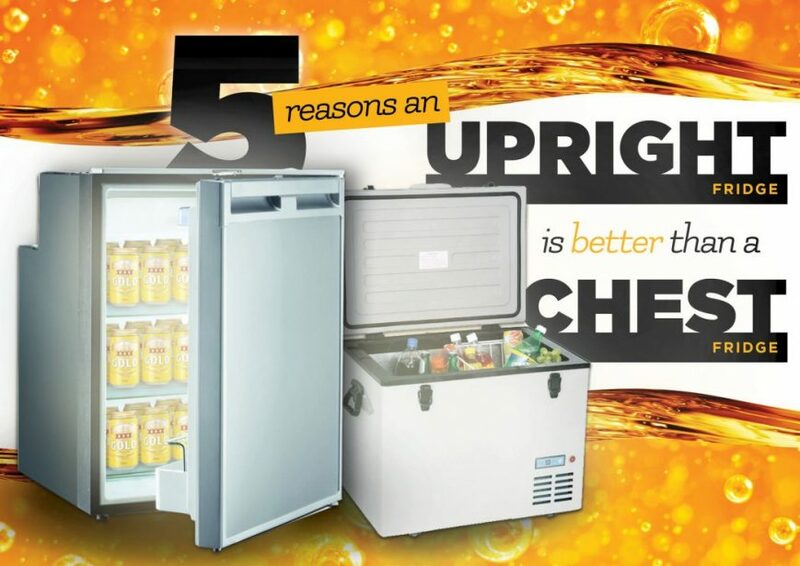 Where the 80L Engel weighs 42kg, the upright version weighs 28kg… roughly a carton of stubbies less. Now considering you don’t need a slide, tilt-slide or drop-slide to access your fridge, that weight saving becomes even bigger. Considering how much some of these burly steel contraptions can weigh, that’s a big saving on the scales. It’s just like a little bar fridge, with an Engel swing motor attached to the back. Open the door, and get your stuff. It’s so easy to get things; condiments and fruit even jump out at you as you open the door. It’s not so good at keeping things secure, but at least you get to maintain your fine motor skills at Ninja level. Trayback utes are the new black these days in terms of touring setups, and for good reason. You can customise and set up a canopy for 4WD touring to just-about perfection. If you’ve got enough height in your setup to fit one of these upright fridges, you’d be mad not to consider one. Are there ANY negatives to consider? It’s not all apples, of course. The upright does come with a couple of drawbacks: Contents move around a lot when the door opens, turning you into David Boon at short leg every time you open the door. Along with your tomatoes and mayo, all of your cold air falls straight out as well. So your auxiliary battery will be working a bit harder. And of course the installation is more complicated. You need to mount the fridge with bolts and brackets, and you need to protect the back of the unit from impacts with some kind of shield. I used $15 worth of steel mesh from the hardware store. Job done. This article was originally posted by Unsealed 4X4.